The trio sonata was one of the most popular forms of chamber music in the first half of the 18th century. Many composers contributed to the genre, and that certainly goes for Georg Philipp Telemann. In his work-list we find a large number of pieces for two instruments and basso continuo. They are different in scoring and formally Telemann sometimes deviates from the sonata as it was modelled by Corelli. The Trio sonata in d minor, for instance, begins with a fast movement, which is followed by an adagio and two further fast movements. Telemann loved the combination of instruments from different families. We find various sonatas for recorder, transverse flute or oboe with a violin or a viola da gamba. This disc includes the sonatas for recorder and violin. In some recordings one may find sonatas which are omitted here, but that is because in those pieces the second melody part is for a descant viol. 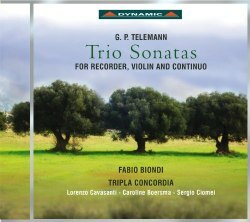 Trio sonatas were mostly written for the amateur market, and those by Telemann are no excpetion. He paid much attention to writing good melodies which were pleasant for the ear and nice to play. There are plenty of these qualities in the sonatas on this disc. The fast movements are lively and energetic, and include some really catchy melodies. This is music for domestic entertainment but it’s by no means devoid of expression. The grave from the Trio sonata in a minor (a1) and the affettuoso from the Trio sonata in a minor (a4) are good examples. The Sonata in f minor begins with a beautiful triste. This is an addition to the programme; it is taken from the collection Der getreue Music-Meister, and is scored for recorder or bassoon and bc. There is much to enjoy here. That goes especially for Lorenzo Cavasanti; previously I have welcomed various recordings by him. Caroline Boersma and Sergio Ciomei deliver excellent support. Things look a bit different with regard to Fabio Biondi. In some fast movements his tone is not very subtle - rather unpolished and even scratchy. An example is the very first movement on this disc, from the Trio sonata in d minor. It is played at breakneck speed - too fast, I would say - and here he produces a rather unlovely sound. At such moments he tends to overpower the recorder. In slow movements his playing is more enjoyable. However, over the years I have heard performances in which recorder and violin blend better than is the case here. On balance, these are not ideal performances. Those who want to add the works to their collection should probably look elsewhere. The short playing time doesn’t help either.